If you're up on the latest Java technologies, then you know that Enterprise JavaBeans (EJB) 3.0 is the hottest news in Java this year. In fact, EJB 3.0 is being hailed as the new standard of server-side business logic programming. 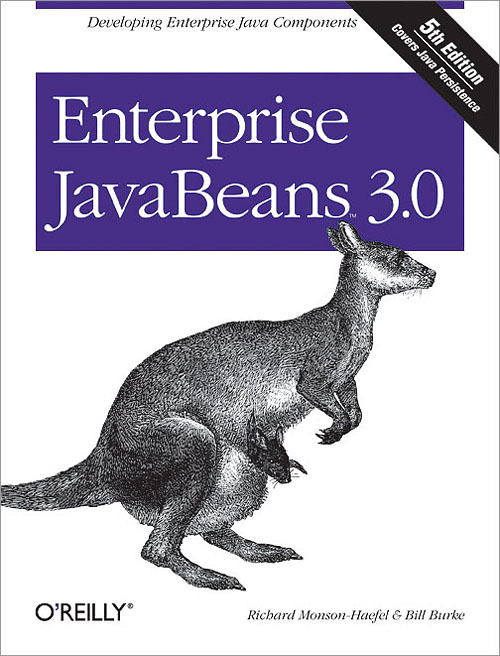 And O'Reilly's award-winning book on EJB has been refreshed just in time to capitalize on the technology's latest rise in popularity. This fifth edition, written by Bill Burke and Richard Monson-Haefel, has been updated to capture the very latest need-to-know Java technologies in the same award-winning fashion that drove the success of the previous four strong-selling editions. Bill Burke, Chief Architect at JBoss, Inc., represents the company on the EJB 3.0 and Java EE 5 specification committees. Richard Monson-Haefel is one of the world's leading experts on Enterprise Java. Enterprise JavaBeans 3.0, 5th Edition is organized into two parts: the technical manuscript followed by the JBoss workbook. The technical manuscript explains what EJB is, how it works, and when to use it. The JBoss workbook provides step-by-step instructions for installing, configuring, and running the examples from the manuscript on the JBoss 4.0 Application Server. Although EJB makes application development much simpler, it's still a complex and ambitious technology that requires a great deal of time to study and master. But now, thanks to Enterprise JavaBeans 3.0, 5th Edition, you can overcome the complexities of EJBs and learn from hundreds of practical examples that are large enough to test key concepts but small enough to be taken apart and explained in the detail that you need. Now you can harness the complexity of EJB with just a single resource by your side.